A taste of the Kentucky Derby is coming to Englewood. Which means for the ladies, it’s time to start thinking about a Derby hat! The event is a fundraiser for Englewood Beach Waterfest to support their mission that is committed to boosting the local economy while generating and then donating all proceeds to deserving organizations that foster the conservation and protection of our coastal waterways and marine life and encourage the responsible and recreational use of our beaches and water resources. The event will also benefit Branded Heart Stables non-profit organization. Owner Kathy Genth is known for her therapy horse named Hope, who only stands 28 inches tall. Hope is a local celebrity who visits hospitals, nursing homes and assisted living facilities. Branded Hearts offers children an opportunity to befriend or ride a horse, perhaps for the first time. Genth also has a history of power boat racing…proving horsepower has always been her passion. Derby Day will be like no other derby viewing party in Southwest Florida. The festivities will include a “Taste of Derby” provided by 12 local restaurants, an open bar with featured bourbon libations, chance race wagering, “Horseplay” games, a parade of horses from Branded Heart Stables, a “Hattitude” competition for the ladies and of course, the live viewing of the official 145th Run for the Roses. 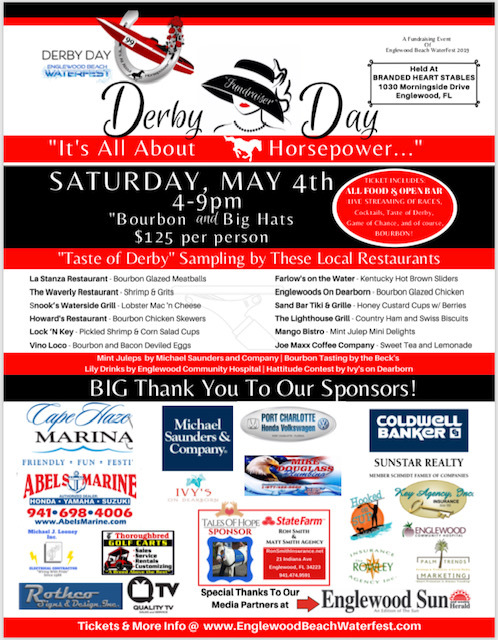 The Derby Day event is going to be held on the grounds of Branded Hearts Stables on Morningside Drive on Saturday, May 4, 2019 from 4:00 PM until 9:00 PM.. Tickets are $125 per person and can be purchased online at EnglewoodBeachWaterfest.Com. The Englewood-centric theme, “It’s All About Horsepower” celebrates our equestrian and boat racing enthusiasts, and the winning spirit of those who energize our community. For those that don’t know, the Kentucky Derby is held annually in Louisville, Kentucky, on the first Saturday in May and is known as the “Most Exciting Two Minutes in Sports”. The Derby Day event is being organized by the newly formed Englewood Fillies. Co-chairs Elaine Miller and Carol Moore have joined together with 12+ civically minded women, all who endeavor to broaden their charitable and social footprints. Their hosting of the Englewood Derby Day festivities pays homage to the Louisville, Kentucky Fillies who since 1959 have planned and hosted an array of Kentucky Derby events for the benefit of charitable organizations and initiatives.